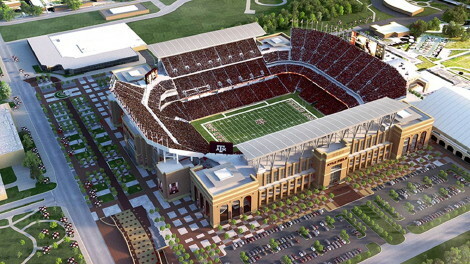 Texas A&M University, is primed to provide Aggie players and fans with what is expected to be the largest video display in all of college football at Kyle Field in College Station, Texas. Daktronics, based in Brookings, South Dakota, will design, manufacture and install the 47’ high by 163’ wide LED video display and featuring 1080 resolution – believed to be the first display at the college level to feature 1080 resolution – prior to the start of the 2014 season. And that’s only one of multiple displays Daktronics is installing at Kyle Field. Texas A&M University officials visited football venues around the country to compare display technology and were very impressed with the brightness and overall quality of Daktronics 13HD LED video display product. “As part of the redevelopment of Kyle Field, it was paramount to find the best technology available to showcase Texas A&M’s in-game experience and traditions on game day,” says Eric Hyman, director of athletics. “We found that the Daktronics technology is highly regarded in the industry, and we look forward to a strong partnership in providing the 12th Man an unparalleled experience in college football.” (12th Man is an expression used to mean the people in the stands). This primary Daktronics display, to be installed in the south end zone, will incorporate the very latest in LED technology to provide excellent image clarity, contrast and wide angle visibility through its 13 HD pixel layout. It will incorporate multiple levels of protection from the elements. Meeting the expectation of football fans everywhere, the display will be capable of showing one large image to highlight live video and instant replays. It can also be divided into separate windows to show all the other information that fans crave as part of the enhanced in-game experience, including a variety of vivid graphics, real-time statistics, scoring information and sponsor elements. Daktronics will also be installing two auxiliary displays, one in each corner at the north end of Kyle Field. Each display will feature a 15 HD pixel layout and measure 36’ high by 54’ wide. Five individual ribbon displays will be installed around the seating fascia of the stadium – all featuring a 15 HD pixel layout and measuring more than 3’ high and varying in length from 160’ long to 510’ long. These displays will provide the opportunity to provide up-to-the-minute statistics and game information, enhance the overall venue experience, and showcase sponsors throughout events. In Kyle Field’s new Hall of Champions, a 6mm display measuring more than 15’ wide by 28’ high will also be installed for Aggie fans. In addition, Texas A&M has asked Daktronics to install six units of Daktronics Street Furniture units surrounding Kyle Field. These eye-level video displays have great appeal for foot traffic with a very tight, 6mm pixel spacing to maximize close viewing distances. Each of these glass-encased displays will measure more than 5’ high by 4’ wide and will be strategically placed near highly traveled walkways to enhance wayfinding and generate pregame excitement. “A 1080 resolution main display, auxiliary video displays, ribbons boards and street furniture units will give Kyle Field the most dynamic visual display system in college football,” says Dan Fjeldheim, sales rep at Daktronics. Daktronics will be including its powerful Show Control System with this installation. This industry-leading system provides a combination of display control software, world-class video processing, data integration and playback hardware that forms a user-friendly production solution. In addition to the equipment installation, Texas A&M will also receive a bank of hours for the creation of digital content to be produced and delivered by Daktronics Creative Services. This content will consist of any mixture of sponsorship messages, crowd prompts, headshots, game opens and venue announcements at the request of Texas A&M Athletics. Texas A&M previously engaged Daktronics to install a new main video board at the university’s baseball stadium, Blue Bell Park. The baseball video board, which measures 1,358 sq. ft. at 27.6’ x 49.2’, boasts a 15mm video display and a resolution of 552 by 984. The video board is the largest in the SEC and one of the five largest video boards in college baseball. Texas A&M University boasts one of the top collegiate athletics programs in the country. This entry was posted on Tuesday, February 25th, 2014 at 16:01 @709 and is filed under Scuttlebut. You can follow any responses to this entry through the RSS 2.0 feed. You can leave a response, or trackback from your own site.